A reliable lift station with extra height for additional options. The newest addition to the Gorman-Rupp line of fully customizable, pre-engineered packaged pumping systems, the ReliaSource® 6x6T Above-Ground Lift Station gives you three feet of additional height and a plethora of additional benefits and options. Like the traditional 6x6 Above-Ground Pumping Station, the 6x6T combines quality construction and convenience and comes ready for immediate installation. And with the taller configuration, you get more sophisticated controls, increased hydraulic capabilities, more horsepower, and easier access for routine maintenance. Choose the 6x6T above-ground model, and choose the ultimate in heavy-solids handling, convenience and reliable performance. ReliaSource stands for lift stations you can rely on. Guaranteed. ReliaSource® lift stations include above- and below-ground pumping stations that are 100% custom-engineered, manufactured, assembled and pretested by the experts at Gorman-Rupp in our state-of-the-art facilities. That means when you choose a ReliaSource lift station to meet your sewage and solids-handling needs, you choose the ultimate in reliability, long-lasting performance and guaranteed value. Gorman-Rupp developed the ReliaSource line of complete packaged lift stations to eliminate costly service interruptions that result from inferior lift station components. 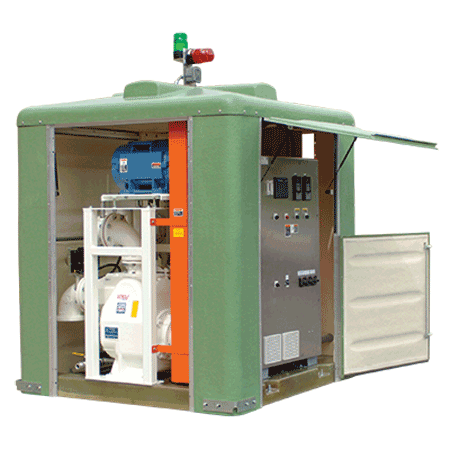 By putting the Gorman-Rupp name on the entire lift station, from the pumps, to the enclosures, controls and valves, we can custom-engineer a quality pumping system from the ground up. We can deliver it to your location, ready for immediate installation. We can simplify your parts and service needs. And we can guarantee your investment for the long haul with the industry's best warranty. Gorman-Rupp has manufactured more than 12,000 pump stations over the last 40 years and our world class team of distributors has worked closely with thousands of municipalities around the world, making us the proven experts in developing, specifying and servicing complete packaged lift stations. If you want a lift station that performs as it should and meets your sewage and solids-handling requirements year after year, make ReliaSource your single source for lift station satisfaction today.